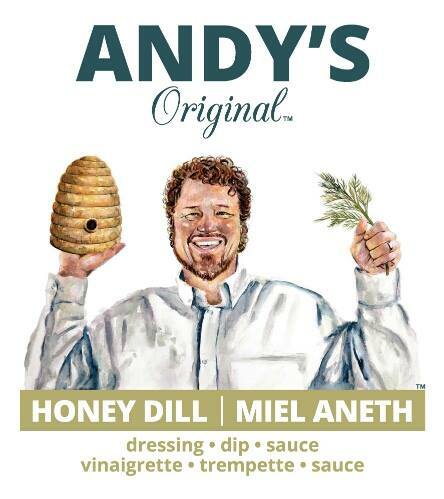 PEC Foods Inc. makes a variety of products, including Andy’s Original Honey Dill Dressing, a recipe that has been in Andy Wunsch’s family since 1982. Proudly Canadian, it has been the house dressing at all restaurants Andy’s owned and worked in. Now is the time to share it with you! It’s superb over cooked vegetables, seafood, chicken and of course over your favourite salad and greens. Toss it in with your tuna or salmon salad or use simply as a dip for your preferred raw foods. Made with Ontario honey, it contains no artificial colours, preservatives or additives, is naturally gluten free, and suitable for a vegetarian diet. Make sure to try the newest Andy’s Original product: Sweet Tomato Basil. Use it as a dressing, dip, or sauce; it’s delicious over shrimp, chicken, pork, lamb, beef and more!